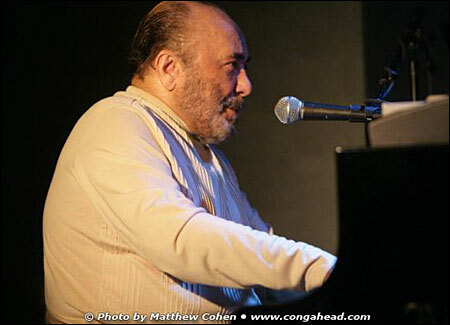 On February 23, 2005, I attended the performance of Eddie Palmieri and his band, "La Perfecta #2". The event took place at The Blue Note in New York City. It was Eddie at his best. Long time supporters of LP®, Little Johnny Rivero and Johnny "Dandy" Rodriguez were in top form. I was glad to have my son, Matthew with me to cover the bulk of the photography. The band consisted of Eddie Palmieri, piano; Little Johnny Rivero, congas; Johnny "Dandy" Rodriguez, bongos / bell; José Clausell, timbales; Herman Olivera, vocals; Nelson Gonzalez, tres; Joe Santiago, bass; Jimmy Bosche, trombone; Doug Beavers, trombone and Karen Joseph, Flute.